Selfweighed, presettable tare (direct or calculated). - Calculation of amount, with price linkable to the article. - Fixed or variable weight functioning. - Configurable dual currency management with conversion factor. 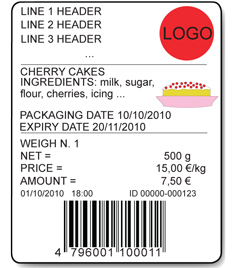 - EAN product code management and checkdigit calculation. 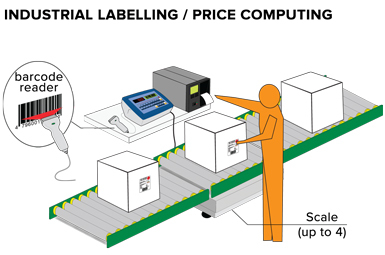 - Traceability of the product. - Seasoning date and expiry date management. Horizontal totalization (sum by lots), vertical (sum by formulation), in discharge of the weight and the amount, manual and automatic. 4 levels of totals zeroable and printable in an independent way: partial total, general total, grand total, total by article. Selection of visualized data on the graphic LCD display. reception and visualization of the weight from a scale or an external device through serial port, with the possibility to use the received data for all the available functions. Database of 1000 Articles with 4 alphanumeric descriptions of 30 characters, EAN code, checkdigit on the weight, linked tare, predefined print format, functioning as weight or price/amount, price, seasoning date, expiry date; 50 linkable ingredients, linked customer. Database of 200 Customers with alphanumeric description of 5 lines of 30 characters. Database of 300 Tares; lock/unlock tare function. Selection of Article, Customer, Tare from the database through bar code reader emulating the keyboard. "Calculator" function: it is possible add, subtract or multiply two values entered with the keyboard, print the result and apply it to the tare. Programmable printout from keyboard or from PC (through the free Dinitools.net software) of 30 print formats linkable to various functions (Totalization, Article Total, Partial total, General total, Grand total); each print format may contain up to 2048 positions which may be ASCII codes or preconfigured print blocks (i.e. product description, EAN code, ingredient description, lot and weigh progressive numbers, gross weight, tare, net, additional total, date and time, etc.). Prints list of last 50 weighs; prints product database with product's weight data.